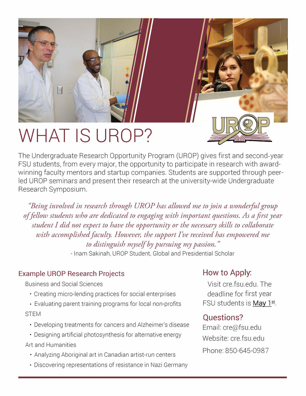 The Undergraduate Research Opportunities Program is for students in all majors. Only current first-year FSU students or incoming high school or transfer students can apply for this opportunity. The deadline to apply is May 1st, 2017 for High School students and first-year FSU students, and July 1st for transfer students. More information on UROP is available here.